WASHINGTON (CNN) -- More than two dozen guests joined first lady Michelle Obama at the president's speech to a joint session of Congress Tuesday night. 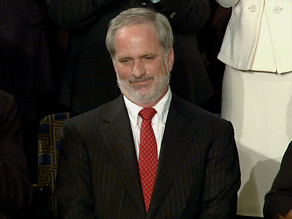 Leonard Abess Jr. was recognized by President Obama during Tuesday's State of the Nation speech. One person on the first lady's guest list was Leonard Abess Jr., a Miami banker who received a $60 million bonus from the proceeds from the sale of shares of City National Bank in Florida and gave it out to his 399 workers and 72 former workers. During his speech, President Obama said Abess didn't tell anyone about his generosity, but when the local newspaper found out, Abess simply said, "I knew some of these people since I was 7 years old. I didn't feel right getting the money myself." Abess demonstrates the kind of "responsibility" the president has called for from high-profile financial CEOs, the White House said. Obama contrasted Abess' story with the greed that he said got the country into the problems it faces now. "CEOs won't be able to use taxpayer money to pad their paychecks, or buy fancy drapes, or disappear on a private jet. Those days are over," Obama said. Obama also referenced in his speech an eighth-grader who wrote a letter to members of Congress appealing for help in rebuilding her deteriorating school. iReport.com: What do you want to hear from Obama? Ty'Sheoma Bethea, a student at the J.V. Martin Junior High School in Dillon, South Carolina, was invited after a letter she sent lawmakers appealing for help rebuilding her school made its way to President Obama. Obama talked about the school during his first news conference earlier in February as evidence of crumbling schools across the country. Other guests of the first lady Tuesday night included injured Afghanistan veteran Spc. Jonathan N. James, equal pay advocate Lilly Ledbetter and Blake Jones, the co-founder and president of a solar electric company. The president and first lady also invited Vermont Gov. Jim Douglas -- one of the president's key Republican allies among the nation's governors in passing the massive $787 billion stimulus bill -- and Ohio Gov. Ted Strickland, a key Democratic governor whose state is among the hardest hit by the economic downturn. The practice of inviting guests to sit in the House Gallery is a tradition dating back to 1982 when president Ronald Reagan recognized Lenny Skutnick -- a good Samaritan who pulled a survivor out of the frozen Potomac River in Washington after an Air Florida plane crashed into the 14th Street Bridge. Since then, presidential administrations steadily increased the number of invitees to the first lady box, often including prominent athletes and celebrities, citizen heroes, members of the military, and individuals likely to benefit from policies proposed by the president. It has also become customary for the president to acknowledge a handful of guests sitting in the box during his speech, especially those who have a particularly compelling story or illustrate a point he is trying to make. Earlier Tuesday, House Speaker Nancy Pelosi announced an expansive guest list of her own, including hero-U.S. Airways pilot Chesley "Sully" Sullenberger and several other crew members of flight 1549. CNN's Alexander Mooney contributed to this report.